A VEGAN protein bar that's LOW in Sugar and less than 200 calories per bar?.. That's right! 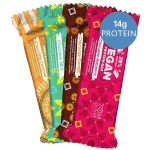 These smooth chocolately bars are sure to satisfy any sweet cravings whilst giving you a protein boost with 14g per bar. 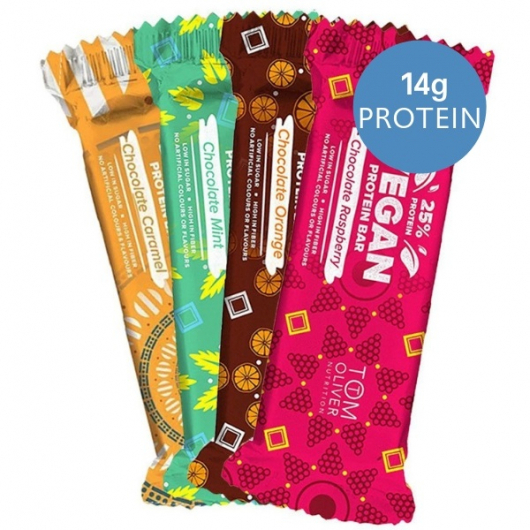 It’s a protein bar experience unlike any other, whether you’re searching for an on-the-go snack or shake substitute, Tom Oliver Vegan protein bars are the perfect choice. Organic Cacao Nibs (2%), Coconut Oil, Thickener: Acacia Gum, Freeze Dried Raspberry Pieces (0.8%), Extra Virgin Olive Oil, Natural Flavourings. Sweetener: Maltitol, SOY Protein Isolate (18%), Fat Reduced Cocoa Powder (12%)(Cocoa, Acidity Regulator: Potassium Carbonate), Hydrolised WHEAT GLUTEN Peptides, Chicory Fibre, Vegetable Glycerine, Organic Cacao Butter (6%), Nibbed PEANUTS, Organic Cacao Nibs (2%), Coconut Oil, Thickener: Acacia Gum, Extra Virgin Olive Oil, Natural Flavouring. Sweetener: Maltitol, SOY Protein Isolate (18%), Fat Reduced Cocoa Powder (12%)(Cocoa, Acidity Regulator: Potassium Carbonate), Hydrolised WHEAT GLUTEN Peptides, Chicory Fibre, Vegetable Glycerine, Organic Cacao Butter (6%),Organic Cacao Nibs (2%), Coconut Oil, Pepermint Crisp (1%) (Sucrose, Natural Peppermint Flavouring),Thickener: Acacia Gum, Extra Virgin Olive Oil, Natural Pepermint Flavouring, Natural Flavouring. Sweetener: Maltitol, SOY Protein Isolate (18%), Fat Reduced Cocoa Powder (12%)(Cocoa, Acidity Regulator: Potassium Carbonate), Hydrolised WHEAT GLUTEN Peptides, Chicory Fibre, Vegetable Glycerine, Organic Cacao Butter (6%), Dried Orange Peel (2%) (Orange Peel (53%), Sugar, Glucose-Frucotse Syrup, Acidity Regulator: Citric Acid), Organic Cacao Nibs (2%), Coconut Oil, Thickener: Acacia Gum, Extra Virgin Olive Oil, Orange Oil, Natural Flavouring.